Health-related Sustainable Development Goals won’t be met unless global, regional and country efforts are intensified, WHO Director General Dr Tedros Adhanom Gheyebresus declared yesterday. But he expressed hopes that a WHO-led Global Action Plan for Healthy Lives and Well Being For All, could help get progress back on track. The action plan, involving 11 other UN and donor agencies, is being drafted in response to a request by Norway, Germany and Ghana, to be presented at the United Nations SDG Summit in September. “The SDG Action Plan, this is a great opportunity that we should not really miss – it will help us align accelerate and account at the global level, but especially at the country level where change can happen,” Dr Tedros said. The 34-member EB governing body reviewed WHO’s update on Implementation of the 2030 Agenda for Sustainable Development, tracking progress on some 30 health-related SDG targets. While significant progress has been made in reducing childhood mortality, expanding treatment for people living with HIV, and reducing deaths from tuberculosis, progress has “stalled” in other areas, such as malaria, drug-resistant tuberculosis, alcohol use and air pollution, the report says. Even more worrisome, “gains that have been made could easily be lost,” due to weak health systems and poor emergency preparedness, among other factors, the report warns, noting that at least half of the world’s population does not have full coverage of essential health services. 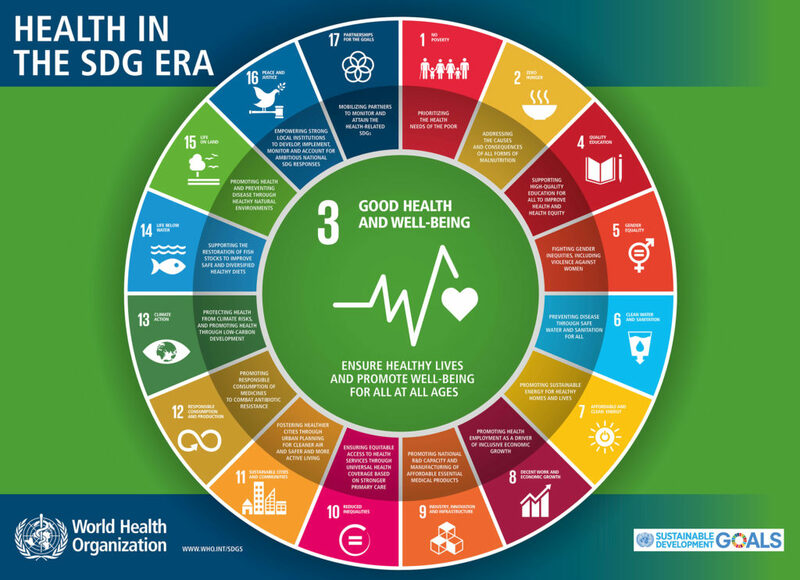 SDG 3 – “Ensure Healthy Lives and Promote Wellbeing for All” – is the principal ‘health” goal among the 17 Sustainable Development Goals, adopted by the United Nations in 2015 as part of the 2030 Agenda for Sustainable Development. However, there are over two dozen other health-related targets embedded in other 16 SDGs, ranging from: health in relation to gender equality (SDG 5); safe drinking water and sanitation (SDG 6); household air pollution and energy (SDG 7); air pollution and healthy cities (SDG 11), decent work and economic growth SDG 8); health impacts of climate change (SDG 13), and so on. The WHO EB report provides a snapshot of progress and gaps in seven thematic areas, including: reproductive, maternal and child health, and nutrition; infectious diseases; non-communicable diseases, tobacco control, substance abuse and mental health; injuries and violence; universal health coverage and health systems; environmental risks; and disease outbreaks. Executive Board members underlined the need to find ways to step up action in areas not on track, including: malaria and drug-resistant TB; deaths from air pollution and other environmental risks; maternal health; sexual and reproductive health; non-communicable diseases; alcohol abuse and mental health; universal health coverage, health of migrants, indigenous people and other vulnerable groups, and more. “In spite of the progress that has been made in some areas, reducing child mortality for instance, and improving treatment for HIV — other areas, such as malaria, which remains endemic in most African states, air pollution and dealing with other health-related environmental determinants — have not seen the same progress, and that can jeopardize the gains that have been made,” said Burundi’s EB representative, speaking on behalf of the 47 countries of WHO’s Africa Region. “We remain convinced that a multi-sectoral approach and a coordinated approach in implementing the 2030 agenda is vital,” he added. Regarding the SDG-related Global Action Plan, the first phase dubbed “Align, Accelerate and Account” was presented at the Global Conference on Primary Health Care, in Astana, Kazakhstan in October 2018. Phase I of the plan set out seven “accelerator” workstreams, including: sustainable finance, health systems, community engagement, health ‘’determinants’’ (e.g. environmental, economic or social conditions that affect health); R&D and innovation, data and programming, and innovative programming in fragile and vulnerable states. However, member states such as the United States underlined the need for WHO to begin country consultations on the draft plan begin immediately. Germany, one of the original sponsors, urged WHO to also expand consultations to civil society, the private sector and development aid donors. Dr Tedros said that to tackle the broad range of health challenges that were faced in meeting SDG goals and targets, those countries most urgently in need also should be prioritized for greater attention, and more holistic solutions should be embraced. And 12 countries would be targeted for greater focus on mental health, he said, noting that some 800,000 people die annually from suicide: “So in 12 countries we are starting to target populations; we need to start treating mental health like any other health problem,” he said, adding the issue should be incorporated more fully into the NCD agenda as well. Finally, the WHO director general said he is in discussions with leading organizations of health care professionals to step up training activities in collaboration with WHO, to strengthen health systems. Dr Tedros said that this would be part of the proposed “WHO Academy”, which he outlined to the Board this week (HPW, WHO Executive Board, 25 January 2019) as a means of expanding the reach of the voluminous guidelines, guidance and tools that the organization produces on a wide range of health issues.